We’d love your help. 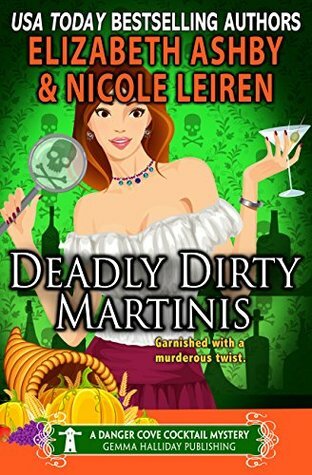 Let us know what’s wrong with this preview of Deadly Dirty Martinis by Nicole Leiren. Lilly Waters is loving life as the new assistant manager at the Smugglers’ Tavern in the small town of Danger Cove. So the last thing she wants or expects is an impromptu family reunion with the wannabe-rock star dad and his number-one-fan (her mother) who were noticeably absent from her childhood. Not only does Lilly have her hands full dealing with Mom and Dad who act more like teenagers than parents, but she also finds herself in hot water when the son of a Chicago mob boss is murdered on tavern property. Now Lilly's mom is the number one suspect, and Lilly isn't sure where her loyalties lie. The search for answers leads Lilly down a dangerous path where she uncovers more suspects than she can say Thanksgiving grace over—including a tattooed trouble maker, a gambler who turned against the mob, and even her own father! All their motivations prove dirtier than her signature martinis, and if Lilly doesn't get to the truth soon, not only will dinner be ruined, but the killer may serve her up on a silver platter. To ask other readers questions about Deadly Dirty Martinis, please sign up. This was another good addition to the Danger Cove series. What a fun cozy mystery for a long weekend read! I read this book as a standalone but am finding myself wanting to read the rest of the series. A quick and easy read that you will want to find out what really happens to Lilly's mother and if the events bring the family back together. Deadly Dirty Martinis is the eighteenth book in a Danger Cove Cocktail Mystery series. Lilly is happy with how life is going, but things get shaken up when her parents' band comes to town and a band member ends up dead. When Lilly starts looking into it, she realizes most of the band members might have a motive and then her mother is arrested. Time is running out. Will she be able to find the killer in time? Can she prove it wasn’t her mother? A great story to keep you reading! This is the 18th installment in the Danger Cove Mystery Series. I have read and enjoyed each and every one of them. This is a great addition to the series. Love all the quirky characters. My favorite thing is that you never get tired of the series as each book/character is written by a different author. Lily Waters is the creator of the Smugglers Tavern specialty drinks. It also seems that murder and mayhem follows where she goes. With the cast of characters to help solve the latest. Toss in parents and Thanksgiving dinner, what could possibly go wrong. This was fun to read and why did I not figure it out. Enjoy! Another great addition to the series. I really enjoyed the story. I was a bit surprised by who the killer was. I enjoyed learning more about Lily's background. I look forward to reading more of this series. I voluntarily reviewed and Advanced Copy of this Book. A fun quirky read! I love the danger cove series! Lily has her hands full with an impromptu family reunion. Murder happens, then the story takes you away! A must read! Aging rock star quandary that rocked my interest. I loved these new characters. Great read! This is a great book; this is the eighteenth book in the Danger Cove Series written by Nicole Leiren and Elizabeth Ashby. This book can be read as a standalone, but once you read it you will defiantly want to go back and catch up with the other books in this series. Lilly Waters is loving life as the new assistant manager at the Smugglers’ Tavern in the small town of Danger Cove. So the last thing she wants or expects is an impromptu family reunion with the wannabe-rock star dad and his number-o This is a great book; this is the eighteenth book in the Danger Cove Series written by Nicole Leiren and Elizabeth Ashby. This book can be read as a standalone, but once you read it you will defiantly want to go back and catch up with the other books in this series. Lilly Waters is loving life as the new assistant manager at the Smugglers’ Tavern in the small town of Danger Cove. So the last thing she wants or expects is an impromptu family reunion with the wannabe-rock star dad and his number-one-fan (her mother) who were noticeably absent from her childhood. Not only does Lilly have her hands full dealing with Mom and Dad who act more like teenagers than parents, but she also finds herself in hot water when the son of a Chicago mob boss is murdered on tavern property. Now Lilly's mom is the number one suspect, and Lilly isn't sure where her loyalties lie. This is a great book with a wonderful story and well developed characters. This book will keep you reading long into the night. If you are looking for a great book, then you need to read this book. I am looking forward to reading the next book by this great author. I voluntarily reviewed an advanced reader’s copy of this book. The free book held no determination on my personal review. Another wonderful mystery solved in the sweet town of Danger Cove I just love this place.